Buy Online Now! 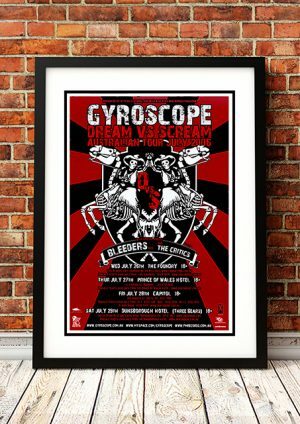 Classic Gyroscope Concert Posters and Memorabilia! 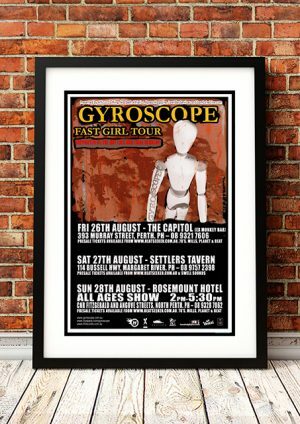 Gyroscope are an Australian rock band from Perth, which formed in 1997 as Gyroscope Sunday. As of 2014 the group has released four studio albums on major labels. Gyroscope’s first major label album, Sound Shattering Sound, was released in June 2004 – seven years after formation. It peaked at No. 37 on the ARIA Albums Chart. Their second such album, Are You Involved?, was issued in September 2005, which debuted at No. 20. It was followed by a double A-sided single, “Fast Girl / Beware Wolf”, both tracks polled on the national radio station Triple J’s Hottest 100 in 2005. The band’s rise in popularity continued with their third album, Breed Obsession, which appeared in March 2008 and peaked at No. 1. 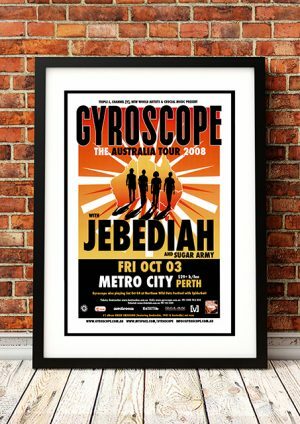 It was nominated for ‘Best Rock Album’ at the ARIA Music Awards of 2008. It provided four singles, including “Snakeskin” and the anthem, “Australia”. The band’s fourth album, Cohesion, was released in April 2010, which reached No. three and included the singles, “Some of the Places I Know” and “Baby I’m Getting Better”, which charted at No. 32 and No. 34, respectively. 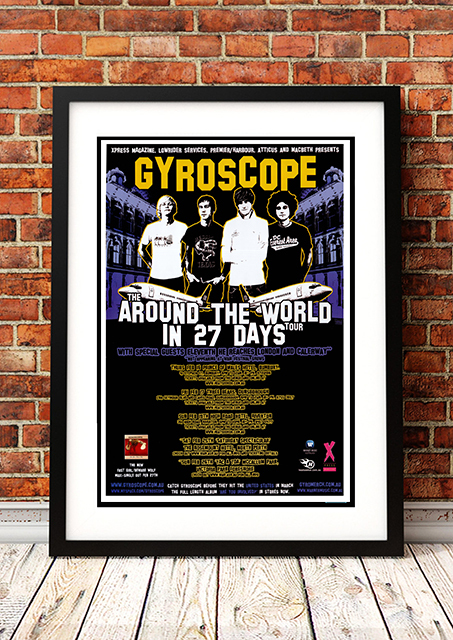 We stock some awesome Gyroscope Prints.